3 entries categorized "Destination Weddings"
Last mass wedding by Rev. Moon? 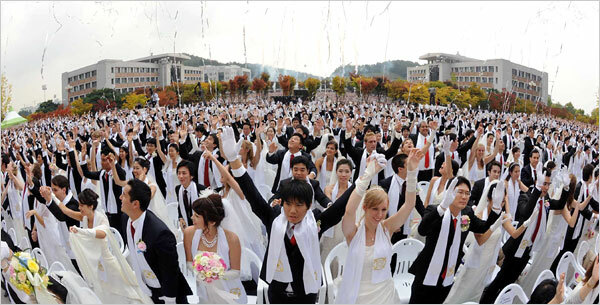 SEOUL, South Korea — Thousands of couples from more than 100 countries traveled here to tie the knot Wednesday in what was seen as the last mass wedding officiated by the Rev. Sun Myung Moon, the controversial and enigmatic founder of the Unification Church. Guess where I was during the coldest days in Chicago?? Sandals Royal Bahamian Spa Resort & Offshore Island!!!!!!!! I was there as the guest of Sandals/ABC with 24 other wedding planners to see and experience Sandals. What a wonderful 4 days and 3 nights we all had. The picture above is the sight I witnessed every night as I left my room and walk to one the restaurants for dinner. I saw 3 brides a one point during their wedding ceremony, reception, or rehearsal dinner. They usually had a few guests with them and all were enjoying this destination "Weddingmoon" experience as much as I was. Thank you Sandals and ABC for inviting me on this trip. I hope I have the opportunity in the future to accompany one of my brides as she walks down the sandy aisle in this tropical paradise. I know I haven't been able to stop telling everyone about the great food, accommodations and beautiful views in this resort of romance. Looking for a great destination ceremony site? Here's the set up at the LaVentia Hotel in Lajolla,CA, for a ceremony. I attended a wedding at the hotel in May and took this picture. It was absolutely beautiful. The Ocean vew is in the background. Time together is made better by a little time away. Not all Wedding Cakes are Round! LUV IT!!! Now this is a great guest book!